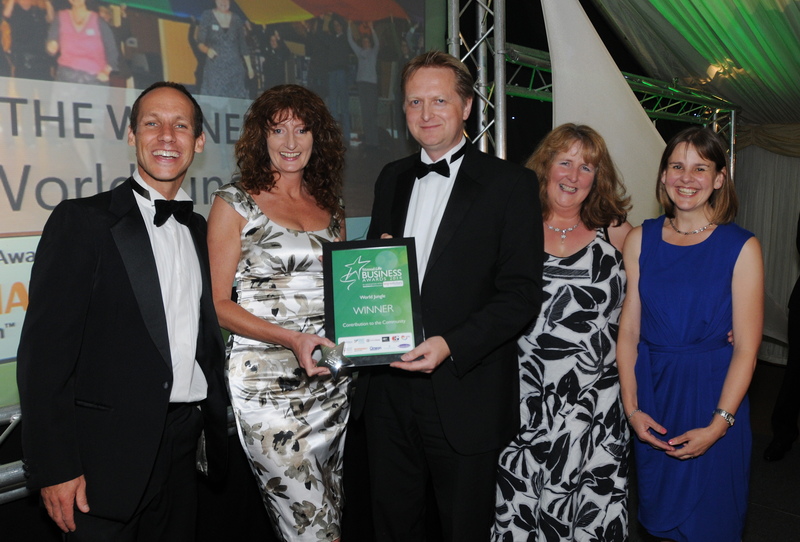 Dursley-based social enterprise, World Jungle, was delighted this week to win the ‘Contribution to the Community’ Award at this year’s Stroud Life Business Awards – for the second time! Founders of the company, Jane Manning and Ben Ward, accepted the award on the evening at an event attended by a diverse range of businesses from across the Five Valleys and Severn Vale. Over the past year World Jungle has run free community fundays and holiday activity programmes, projects to support Young Carers, health and fitness classes for all ages and abilities, environmental activities to encourage people to reconnect with their local environment, and established a community café for isolated older residents in Cam Woodfields. The school summer holidays are just around the corner and children across the Cotswolds will be eager to explore a range of new activities and have fun. What could be better than a stint as a budding chef making yummy meals that will appeal to the whole family? Cotswold District Council’s Summer off the Streets holiday activity programme, run by World Jungle, is offering young would-be Jamie Olivers the chance to create two great dishes that they can take home for the family tea. 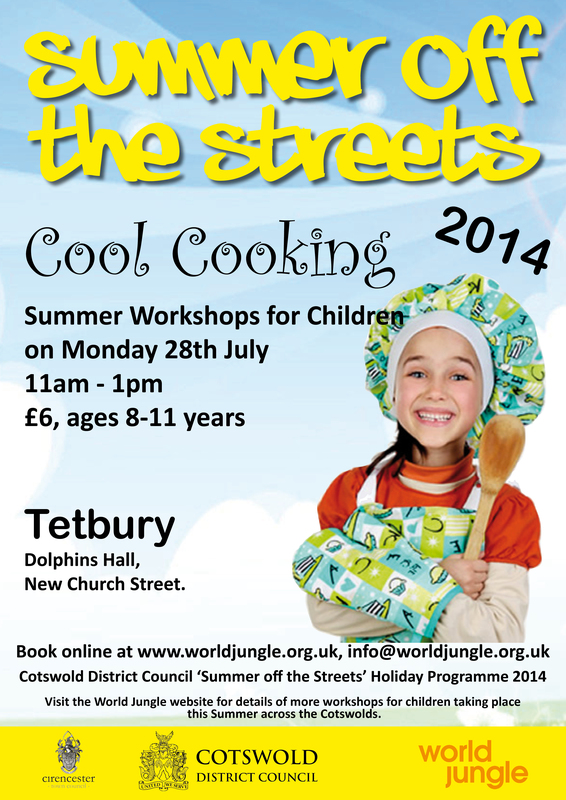 Between 11 am and 1 pm on Monday 28 July, World Jungle will be hosting a ‘Cool Cooks!’ fun activity session at the Dolphins Hall in Tetbury for children aged from 8 to 11 years. The children will receive all the ingredients, equipment and expert tuition that they need to create a delicious savoury salad and some more-ish fridge flapjacks. The cost per child is £6 and the activity must be booked online in advance at www.worldjungle.org.uk – attendees are advised to bring an apron and wear clothes which can cope with being stained. Summer Holiday Fun in Dursley! World Jungle is organising another FREE family fun day event on Thursday 31 July from 1pm-4pm. The event marks the conclusion of their lottery funded ‘All in one Rhythm’ programme which saw a whole range of free events and workshops themed around the Brazilian World Cup and Carnival throughout June and July. “Over the past couple of months this project aimed to make the World Cup an exciting family event, bringing the community together and making it fun, even for those who don’t like football! Whilst some of the football was disappointing, we had fantastic feedback from local people attending our events, who loved the theme of Brazil and Carnival coming out through carnival arts and crafts, samba drumming and capoeira displays and workshops. With the school holidays fast approaching, there has already been a healthy demand for many of Cotswold District Council’s ‘Summer off the Streets’ (SOTS) activities organised by World Jungle. Both the Multi-media workshop and Survival Skills workshop are already fully booked and other activities, which must be reserved in advance, are also filling up fast. “There are still places available for the other courses which require reservations and a small fee such as Cool Cooks, Funky Fashion, Cool Drawing and Creative Felt. However, I would advise anyone interested to put their name down as soon as possible. Learn how to make two delicious treats to take home with you – delicious fridge flapjacks and a yummy savoury salad. All ingredients and equipment provided – bring own apron and wear clothes you don’t mind getting dirty. Age 8-11 years. Join artist and illustrator Imogen Harvey-Lewis in this fast-paced, dynamic drawing session. Create, draw and then animate simple characters – you will be amazed by the results. Age 7-12 years. Have fun with fibres and colour, making a hand-rolled felt picture, a case for your MP3 player or mobile phone, or flowers to wear in your hair. All materials and equipment are provided. Wear suitable old clothes and bring a bottle of water. Age 7 years plus. To see the full range of activities in the Cotswolds this summer holiday – including an impressive range of free non-bookable events – and details about how to reserve and pay for courses which require a fee, please go to the World Jungle website www.worldjungle.org.uk or telephone 01285 623407.